You are here: Home » Festival of Older People is coming! We are facing a w orldwide demographic shift that has never occurred before. Slowly but surely a substantial part of the global population is growing older than 55. Expectations are that this will grow to 35% of the world’s population. That will change everything. It will change our visual culture, sound culture, the economy, healthcare, ways of living together, streetscapes, you name it. 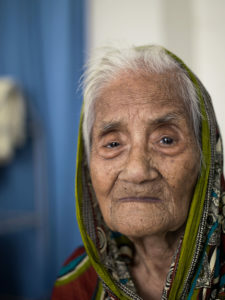 We hope this invokes an uprising among elderly, who will no longer accept social exclusion and isolated lives in nursing homes, where they await their grandchildren and certain death. Instead, we wish to encourage active participation in society. 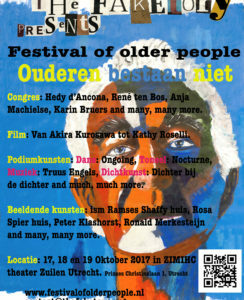 In june 2016, we organise a Festival of Older People in The Netherlands. You can join in by participating with a production, visiting, and contributing beforehand by introducing our Festival in multiple places, we can give lectures and discussions to raise awareness. Part of being old is being part of a stereotype society puts on you. Our Festival addresses the stereotypes, offers alternatives and together with all participants establishes new possibilities.